EXPANDS WITHOUT THE NEED FOR EXTENSIONS: Gro-Gate can expand without the need for extensions making this gate fit openings between 30 inch-53 inch perfect for doorways, hallways and more! VERSATILE 2 WAY OR ONE WAY OPENING: The gate's door can swing open in both directions or can be adjusted to swing in one direction only making it ideal for use at top of stairs! Pressure mounted gates work well to make houses and apartments baby-safe, saving you the hassle of messy installation while protecting your little one. However, they can still pose potential damage to your walls. Dreambaby Protect-A-Wall alleviates that problem. Our Protect-A-Wall Mounting Cups are large and will help disperse pressure from the top supports over a large area, reducing direct force and minimizing the possibility of cracks or collapses. In addition to providing a larger, more secure contact zone, these mounting cups feature a soft non-slip, non-adhesive backing that prevents damage while remaining gentle on your wall. Installing the Dreambaby Protect-A-Wall on a new or existing gate takes literally seconds. Remember it's always important to follow the manufacturer's installation instructions for your gate. For your convenience, this pack includes two Dreambaby Protect-A-Wall Mounting Cups that work at the top contact joints of most pressure-mounted gates. Broadway Xtra-Wide Gro-Gate - Charcoal Dreambaby Broadway Xtra Wide Gro-Gate with Track-It Technology is the ideal childproofing tool to protect children from danger and injury around the home. Featuring an innovative puzzle lock and one handed operation, simply lift the gate and follow it through the puzzle pathway to unlock. 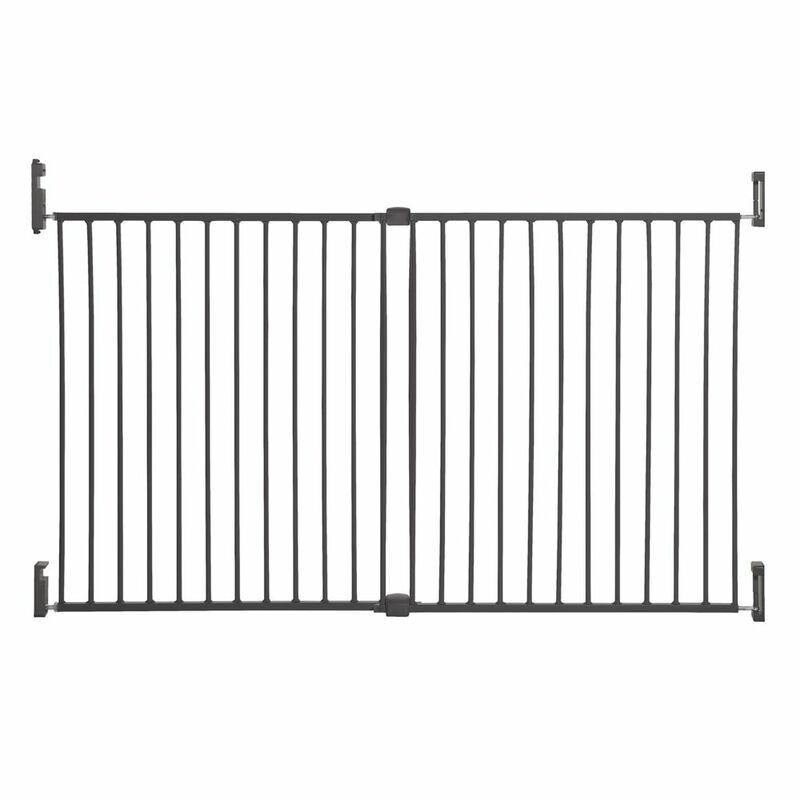 This hardware mounted gate will fit openings between 30 inch - 53 inch and measures 30 inch tall. The gate will swing open in both directions for easy walk through with no tripping hazards. Utilizing the reversible or removable tab, the gate can be limited to swing in one direction only making it perfect for top of stair use. The unique EZY-Check Indicator helps give you peace of mind by clearly showing if the gate is locked or unlocked. When unlocked the status indicator will be red and when locked and secured properly it will turn green. Dreambaby gates add both style and safety to your childproof home.